Since taking on this job, I’ve had a host of enjoyable, not to mention humorous experiences and as time passes, I’m sure I’ll get around to sharing many of these with you. But one event stands out head and shoulders above all the others for its sheer “spine tingling” importance and significance. It was the day we celebrated Her Majesty’s 90th Birthday on 21st April 2016. It had its funny moments too as I shall reveal. The plan was to light beacons all over the country, at elevated locations, all at the same time on the evening of Her Majesty’s Birthday by way of celebration. For those who do not reside in the UK and who may be unfamiliar with this practice, let me enlighten you. It’s an age-old custom, this “lighting of beacons” caper. Essentially, on very special occasions, a bonfire is lit – wherever possible at an elevated spot, so that it can be seen for miles around. Traditionally, a large steel basket is mounted on top of a steel pole, some way above the ground and it is then filled with logs. The whole lot is then doused in paraffin or some similar combustible fluid. A flame is added and, as they say…..”Bob’s your uncle!” Instant flaming beacon! Now, in Glastonbury, we have the perfect location for a beacon. We have Glastonbury Tor! 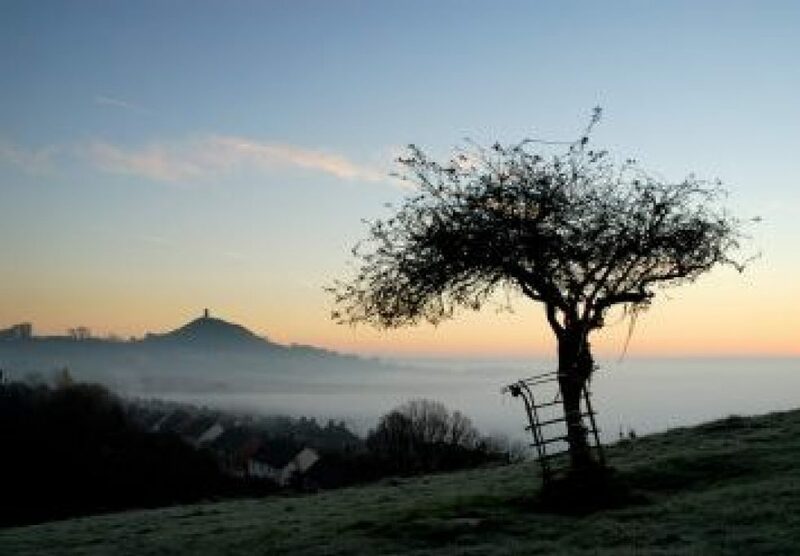 Glastonbury Tor is a hill that rises 518 feet above some reasonably level surrounding scenery. They actually refer to this land as “The Somerset Levels”. Just to add to this strangely conical and almost volcano-shaped hill’s majesty, it has a large stone tower right on the very top – St Michael’s Tower. This tower is the remnant of a church built there in the 1300s. In its own way, the Tor stands out as beacon to travellers approaching it from any direction…….. even without the addition of any flames! It stands out in a remarkably conspicuous fashion for miles around. Talking about the Tor, I’m reminded of an exchange I had with a visitor, just outside the Town Hall, a year or two back. A tall, dishevelled-looking man with, unfortunately for the both of us, severe halitosis, had just stepped off a coach that had arrived from Portsmouth on a day excursion to Glastonbury. I’d hardly finished my “cry” when he came up to me, pointed in the general direction of the Tor and blurted out his question: “That big thing……that big mound of earth over there…… when did they build that?” My reply ran something along the lines of: “That is a natural landform, my friend, a geological outcrop of sandstone, that has resisted erosion for millions of years.” He’d hardly had time to digest the significance of my answer when he rattled off another enquiry. “Who mows all that grass then?” My quick-witted reply (for me) was as follows: “That’ll be the sheep, Sir, they eat the grass, Sir.” He turned around and wandered off, as I started to breathe freely again. I tell you, I get all kinds of questions in my job. 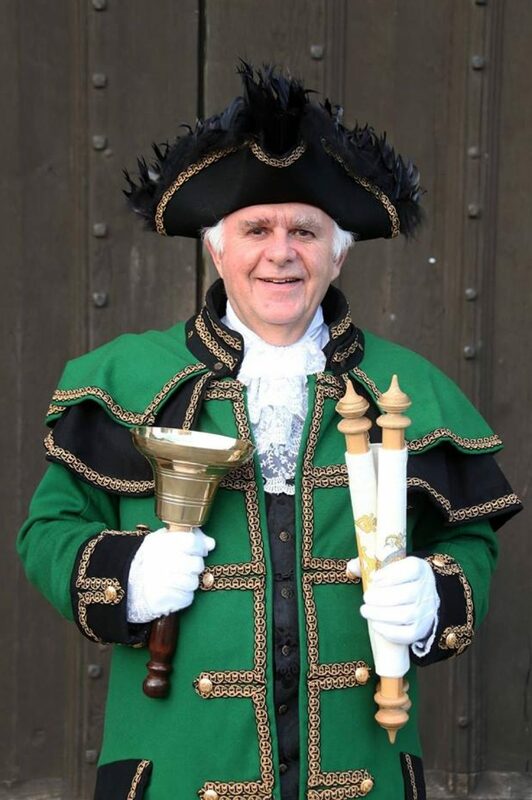 It was at a Town Council meeting a couple of weeks earlier when I’d first heard that I was needed to attend the lighting of the beacon as Town Crier. Now I’ve climbed the Tor many times but this was to be my first time in full regalia. It’s quite a steep climb but well within my capabilities. A few questions flashed through my mind though. Would my shoes get stuck in the mud? Would I slip over, getting my £2,000 worth of livery all muddy and then have to face the wrath of the Town Clerk? Would I snag my white tights on the thistles? Would my tricorn blow off? Most importantly……. would I have any breath left after climbing the hill, should I have to perform a cry? Sure enough, a cry was required. As I soon found out, I was needed to read something out just before the beacon was lit. This was explained to me by a Town Councillor, as he thrust a piece of paper on which was written my script, into my hand at the end of the meeting, a couple of weeks before. “This one’s for you, Dave” he said cheerily, with a rather smug smile on his face. The words were written by HRH Prince Charles, with precise instructions that they were to be read out immediately before the lighting of the beacon. Golly! Little old me was going to have to read out words written by a member of the Royal Family and I was the one going to have to shout it out, on the Tor, in front of hundreds of people, at a never-to-be-repeated event in history. I felt a tingle running up my spine. On the day of Her Majesty’s birthday, the plan was for various local groups (church groups, scouts, guides and the like) as well as many local citizens, to join the Mayor and the Civic Party in an ascent of the Tor, finally, assembling around the readily fuelled beacon. We were to congregate outside St John’s Church in Glastonbury High Street before walking to the Tor. I arrived early, giving a few cries around and about, to let people know what was going on, should any not have heard about the plan and perhaps, wished to join us. In the High Street, as we all killed time, I was approached by a photographer. Judging by the myriad of cameras and lenses that hung from his body like presents on a Christmas tree, he must have been a press photographer. He explained that he had a small bear mascot which apparently, went with him everywhere – the stuffed toy being photographed at just about every photographic location he’d visited. That evening, it was going to be my turn, as the lucky guy being photographed with his small, slightly soiled little bear. The Mayor and the Civic Party were a little delayed due to an important meeting at the Town Hall. A nearby BBC TV presenter hopped anxiously, from one foot to another, in front of his rather bored-looking cameraman, outside St John’s Church. He frequently looked at his watch, his “interview window” with the Mayor of Glastonbury for the local TV news rapidly shrinking, with still no sign of the Mayor. He came over to me and asked me if I was involved in the evening’s festivities. “No, I always hang around Glastonbury in the evening, dressed like this!” (Sorry, I’ve lied……I didn’t really say that at all). “OK, I don’t know where the Mayor’s got to……… but you’ll do!” he insisted. He quickly told me about the sort of questions he was going to ask and then I had approximately 35 seconds to think of some vaguely coherent answers. In no time at all, the “cameras rolled” and I was speaking live on BBC-TV News! Soon after, the Civic Party could be seen striding up the High Street at a brisk pace. What a grand sight they looked in all their robes. Two highly-polished maces, presented to the town by Her Majesty Queen Anne in 1705, were carried by our Macebearers, or to give them their full title, “Sergeants-at-Mace”, Terry and Gary. The brass royal crests glistened in the evening sunshine. “Hey…..you’ve got the matches, right?” I helpfully enquired, shouting down the street. My humour was met with a stony silence. Once assembled, we set off up the High Street, pausing at odd places along the route for more witty banter. I walked a fair way in the procession with the vicar (proudly wearing his red scout scarf) – a most pleasant gentleman. We conversed at length about the current state of the English Education System. The slow and steady climb up the Tor went fairly well. There was a fairly strong and cool easterly breeze, of which I was very glad. It kept me cool under all that regalia. I paused a few times to get my breath. Once assembled around the beacon, various speeches and announcements were made. I was a little irritated with the crowd, since not everyone was listening……..the taking and publishing of selfies on social media taking precedence. Then it was my turn to make the final speech before the beacon was lit. I was very appreciative of several people in the gathering who kindly stepped forward and pulled my capes down when they blew up my back. After all, a Town Crier must always look his best! “I am delighted that so many people throughout the United Kingdom are coming together to light beacons in celebration of my mother, The Queen’s, ninetieth birthday. It is a wonderful gesture which I know has deeply touched Her Majesty. Beacons are to be lit on mountaintops, on beaches, in farmyards and on church towers, uniting us all in our heartfelt appreciation of The Queen’s lifetime of service to the United Kingdom and other Realms, and to the Commonwealth. The paraffin soaked rags, already wrapped around a long pole, were then lit and held aloft by a young boy scout (with a little assistance from the vicar). The beacon ignited successfully and in no time at all, the flames were licking round the basket and out into the darkness. Several times we had to dodge showers of sparks from the beacon as the wind changed. It was my first time on the Tor at night. The lights of Glastonbury and Street shone out as if being seen from a plane. A magical sight to behold. On the way down, I passed some disgruntled people on the way up, who had come to see the beacon lighting. Apparently, the beacon had been lit about 45 minutes before the billed time.